Blueberry High Nicotine E-Liquid by Soltz. the perfect taste of blueberry and a nicotine hit that cannot legally be bettered no matter what you mix. An outstanding achievement in vape technology. Blueberry High Nicotine E-Liquid by Soltz has a formula which makes it the e-liquid with the highest legal content throughout the whole of the E.U. and, because of the salt formulation it has a 36mg/ml Nicotinyl Salicylate (3.6%) which is equivalent to 20mg Nicotine. Even by adding nicotine to a Zero nicotine e-liquid you cannot get near the nicotine hit of this e-liquid. It is in a 10 ml bottle and has huge discounts for purchasing 5 or 10 bottles. Please just buy one initially to make sure it suits you as returns cannot be accepted. 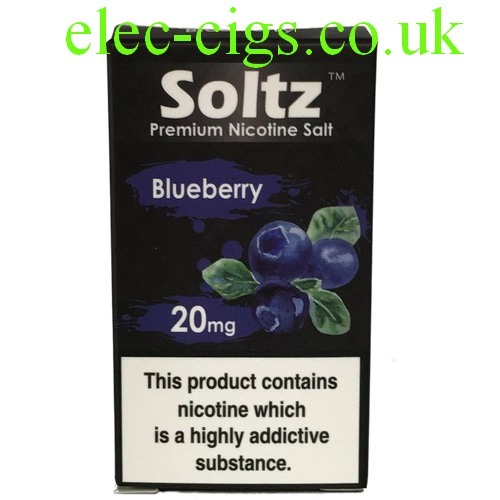 Blueberry High Nicotine E-Liquid by Soltz: The comments with reference to the flavour are a personal interpretation and the claims and figures regarding the nicotine are correct at time of publishing: This product contains nicotine which is a highly addictive substance.